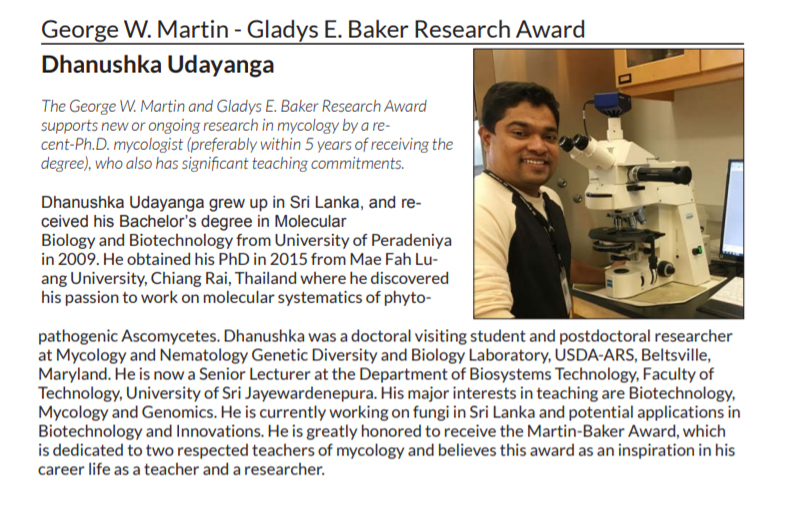 Dr. Dhanushka Udayanga affiliated to the Department of Biosystems Technology, Faculty of Technology was awarded the Martin-Baker Research Award 2018 by Mycological Society of America. This is annually awarded to a recent PhD mycologist for the support of new or ongoing research. The award honors two respected American teachers of mycology, George W. Martin and Gladys E. Baker both of whom had long and distinguished careers in mycology, and both of whom have faithfully served the Mycological Society of America in several capacities. The award was conferred at the MSA award ceremony held in parallel to International Mycological Congress (IMC 11) held in San Juan, Puerto Rico, USA and the list of awardees are published in the September 2018 volume of “Inoculum”, the official newsletter of Mycological Society of America.